I am currently in Montevideo and will be returning back to Germany tomorrow. The Flight between Montevideo to Sao Paolo is operated by GOL Linheas Aereas and from Sao Paolo to Amsterdam is by KLM. This morning I got an email that I could check-in but from my KLM app it says check-in is Unavailable. I used the WhatsApp feature to query the KLM and they told that because the First flight is operated by GOL Linhas check-in is not possible via the App or website. I tried asking if all the boarding passes will be issued at the Montevideo Airport, but I haven't got a response for the same. P.S. all the flights are booked under the same booking ID and have the same E-ticket Number. Anyone has had such an experience while travelling with GOL and KLM under same booking code? First of all I would try to check in online on the GOL website, if this is possible. Since GOL is not a Skyteam member it is likely that they cannot issue the tickets for the KLM flights. 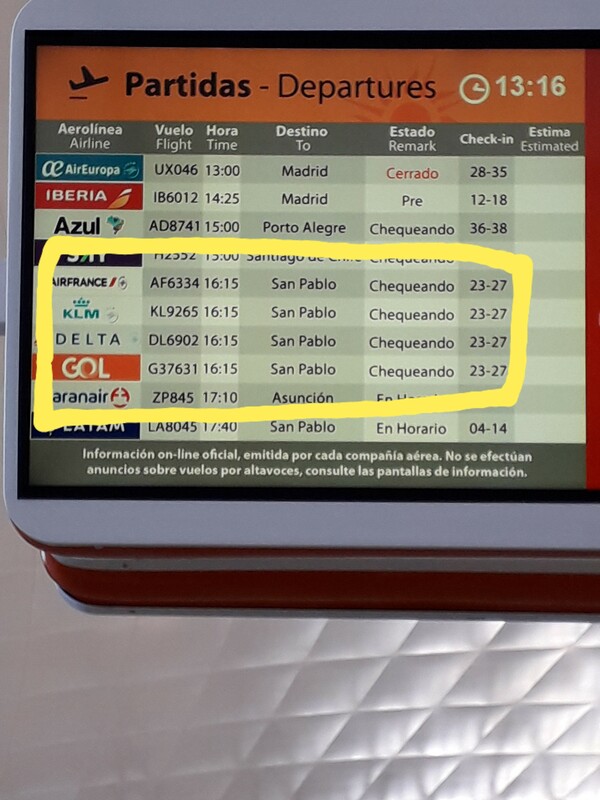 In that case you will need to go to the relevant airline transfer desk (might be serviced by a partner to KLM) inside the terminal at the Sao Paolo airport, where they will issue the tickets for you. You do not need to go through immigration and exit the terminal in order to do this. Your luggage should be forwarded automatically to your final destination since the first flight is international (for domestic flights one sometimes have to recheck the luggage at the airport where you leave the country, this however depends on the country). Since everything is on the same booking, it is mainly the arline's responsibility that you make the connection (1.2 hours is plenty, since you do not need to go through any immigration or security). In the unlikely event that you do not make it in time, since you are flying to an EU destination with an EU-based carrier, you have the right to a nice compensation in case you are delayed/miss the connection, if the fault is due to the airline which ticketing problems surely would fall under. If the check-in for the KLM flight has not yet started, you are still able to choose your seats, even though you cannot check-in for it online. OP here and writing this Answer from MVD. I can confirm that all the Boarding Passes were issued till my destination once I manually checked-in at the GOL gate. It is worth noting that GOL is a partner of the Flying Blue Sky Team alliance. However when it comes to claiming miles on GOL, by default my miles from GRU to MVD were not added and I had to add them by claiming them via KLM app. There was no hassle at all but was only asked an emergency contact number and person before issuing boarding passes. But there are no KLM, Air France, Delta gates at MVD and only GOL. Not the answer you're looking for? Browse other questions tagged airlines check-in south-america klm airline-alliances or ask your own question.